In the Elementary grades, children work with teachers in small groups during a morning academic block. Groups are assembled according to students’ respective math, French/Mandarin language, and English reading levels. This small group work enables teachers to work in greater depth with students and support their progress more intensively. Children come together as a class for morning meeting, snack, outdoor time, lunch, afternoon projects, art, music, and movement. 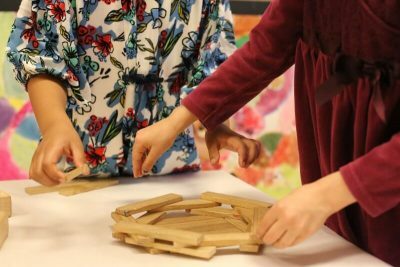 The afternoon academic block is devoted to long-term integrated projects that children are engaged in for days, weeks, and months at a time. Teachers guide children in explorations and experiments, preparing students to be lifelong learners. In Grade 2, we build on the English instruction from Grade 1 for literacy and arithmetic instruction as children learn to read fluently and solidify their understanding of our number system. By Grade 3, children are reading to learn in both languages, and their ability to use the target language in all aspects of their school day has been developed. Instruction in the target language is still 75 percent of the school week in these grades. In Grades 4 and 5, children are using the target language during approximately 60 percent of their school week. Mandatory homework, beyond independent reading or handwriting practice, is not assigned to students before the Upper Elementary grades.